Apex Legends is EA’s take on the ever-popular battle royale genre to compete against PUBG and Fortnite. It was launched three days ago by EA Games and Respawn Entertainment, and it was received widely by worldwide audience. In just three days since its launch it has received more than 10 million players with the numbers still growing. But, the question is, will it be able to take on and gain as much popularity as PUBG (PlayerUnknown’s Battle Ground) and Fortnite, the current leaders of the genre. “In 72 hours, over 10 million players have jumped into Apex Legends and we’ve breached 1 million concurrent players! This has been a truly incredible journey. We tested and tweaked. We argued and agreed. We got to a point where we felt some magic. We knew it would be risky to take the franchise in this direction, to go free to play, and do a surprise launch. But we fell in love with Apex Legends and wanted, needed, other people to play it too,” says Vince Zampella, CEO of Respawn Entertainment. Currently, Apex Legends is available on Sony PS4, Microsoft Xbox One and PC and its free. It has been set in the world of Titanfall, which was developed by Respawn Entertainment but Apex Legends is not going to be the 3rd instalment in the Titanfall universe, the company said. The game is set in the same universe, but the events in Apex Legends unfold after Titanfall 2. It is party to a different section of the Titanfall universe called the ‘Outlands’. 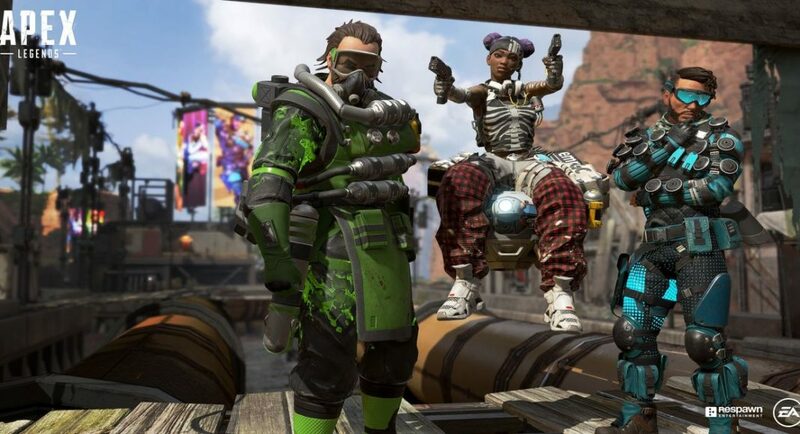 Unlike its competitors where the players have to create and design their own characters they want to see and play with, Apex Legends uses class-based character selection. And like the RPGs, each class has a unique personality, skills and abilities which separates them from other characters. Each character in the game will have an ultimate ability and a passive ability. Some characters might have zip lines or grappling hooks which we saw in Titanfall and other might have toxic chemical weapons and much more. The players can use these unique skills to their advantage and get that kill to win. The game creators have also designed the environment and the battleground in such a way that it favours different characters and puts them in an advantage with their abilities. Besides their skills, the weapons and armour are found on grounds and other map-locations like the other battle royale games. Death in the game is not permanent unless you are playing ‘solo’, when you are down, a teammate can revive you or take the banner off your ‘dead’ body. Then take that to the respawn beacon to get you back in the fight. You lose your gear and weapons but live to fight again. Similarities from other battle royale game are many in Apex Legends, like the weapon customizations, backpacks to hold gear, cosmetic and clothing upgrade etc. The company has promised regular updates, new character introductions, fresh content, weapons, challenges and much more in the coming months. Apex Legends is off to a good start by acquiring more players, but it still has a long way to go if it wants to reach the top level. Games like PUBG have a user base close to 200 million. PUBG and Fortnite are available on Android and iOS as well, which gives them much greater reach and a wider player base. But Apex Legends is not available on mobile devices and the company hasn’t said anything about it. In the coming days we will see if it becomes the next best battle royale game or be another name on the list of this genre.